"Everyone has questions about the economy. I started looking for the answers in economics. I found enough insights to get me interested, but I couldn't seem to make the insights add up. I went back to the original sources, the great economists, and started to see a big picture. And while the whole picture was complicated, no one part of it was all that hard to understand. I could see that all this information made a story. But I couldn't find a book that told the story in an accessible way. So I decided to write one, in the most accessible form I knew: comics." Thus begins Michael Goodwin's new book Economix: How Our Economy Works (and Doesn't Work) in Words and Pictures. The book covers two (plus) centuries of economic history. It starts with the Physiocrats, Adam Smith and theoretical development of capitalism, and then steams ahead into the 19th century, covering the Industrial Revolution, the rise of big business and big finance. Next comes the action packed 20th century: the Great Depression, the New Deal, the threat from Communism during the Cold War, the tax reforms of the Reagan era, and eventually the crash of 2008 and Occupy Wall Street. Along the way, Goodwin and the illustrator Dan E. Burr demystify the economic theories of figures like Ricardo, Marx, Malthus, Keynes, Friedman and Hayek -- all in a substantive but approachable way. 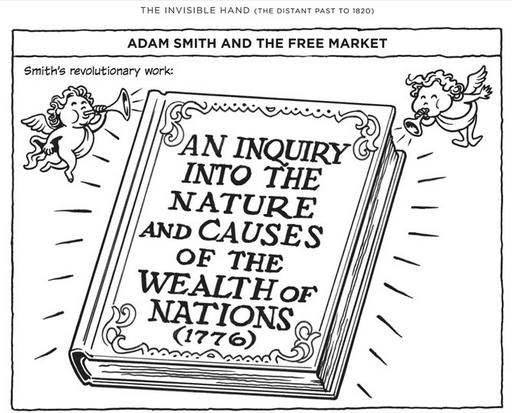 As with most treatments of modern economics, the book starts with Adam Smith. To get a feel for Goodwin's approach, you can dive into the first chapter of Economix, which grapples with Smith's theories about the free market, division of labor and the Invisible Hand. Economix can be purchased online here. Boris Johnson could do with taking a read. I would like to know the opinion of an economist regarding the credibility of this book. It seems to me there is some risk for the layman reader to begin economical education through the eyes of a “free lance writer”. Is he over-simplifying theories? Does he have a clear understanding on the subject? There is a Mexican author, Eduardo del Rio or Rius, who has a great book called economy for beginners in economy. It is a great book and his style is superb. He writes the book as if it were a cartoon strip in the newspaper with some large clauses and many references in his book and involves the reader by asking rhetoric questions. I will check this out but as soon as I read the article I thought about Rius.